Research states that teachers CREATE engagement in classrooms when they ASK STUDENTS TO DO SOMETHING. 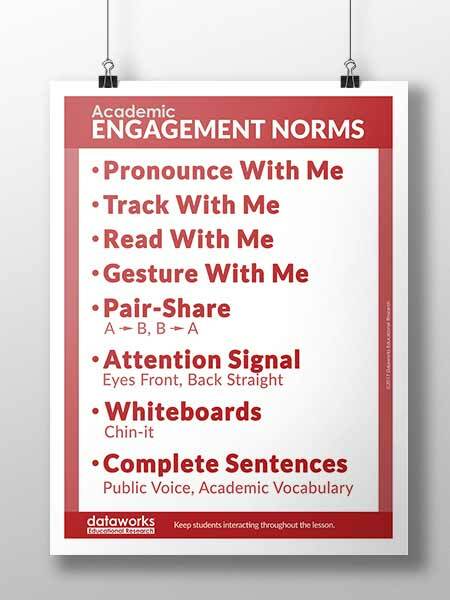 For this reason, the DataWORKS Student Engagement Norms should be used in every class, during every lesson, all day long. Often Explicit Direct Instruction gets a bad rap for being “teacher-centered” instruction where the teacher explicitly teaches the content, often droning on for long periods of time, while students daydream about their plans for the weekend. But when done correctly, Explicit Direct Instruction actually requires the students to talk, write something on their whiteboard, pair-share, or DO SOMETHING at least once per minute. Each of the norms on this poster facilitates that process. Pronounce, track, read, gesture, and pair-share are all ways that students will interact with the content in a meaningful way. The last three items on the engagement norms are specific classroom management techniques that support all this teacher-student interaction. Gesture with me – Stores information in multiple pathways in the brain by incorporating a kinesthetic movement. Pair-share – Processes information by sharing with a partner. Provides students with an opportunity to vocalize their response in their own words. Whiteboard – Check to determine if students are learning and thinking so that the correct effective feedback can be provided. Complete Sentences – Require students to respond using the newly introduced academic vocabulary. Read “How to Implement School-Wide Student Engagement” for a more in-depth look at each of the Engagment Norms with specific examples.